Who doesn’t love a pair of Hunter boots?! They come in tall and short version, can be worn year round, and did I mention they keep your feet warm and dry! 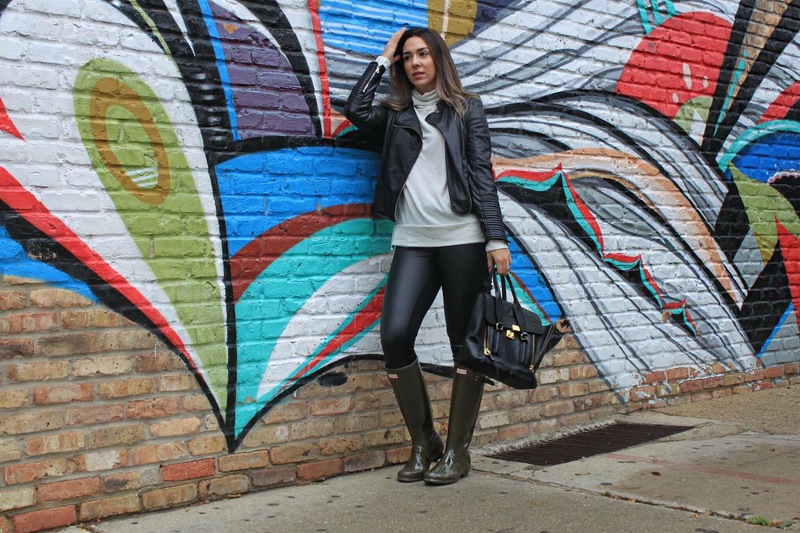 With Chicago’s unpredictable weather Hunter boots are my-go to choice when rain or snow hit the city because they are practical and always in style. In the winter you can line them with boot socks that can be found at Nordstrom, Nordstrom Rack, Lord & Taylor (to name a few), and they come in a variety of colors and material. On this day it was raining on and off and I thought it would be the perfect time to bring out my babies for some fun. We all know these boots aren’t cheap, which is why I am sharing three easy steps you can take to keep them clean and in great shape year round. Store your Hunters in a dry and cool place- this will prevent mildew growth. Wipe and dry after each wearing- I use a washcloth using lukewarm water and a bit of liquid detergent. I hope the tips above help extend the life of your Hunter boots so you can rock them on your next outing. P.s. they are have a huge sale right now, I’ve attached the link down below for you guys! Previous Post 9 Fun Valentine’s Day Ideas That Won’t Break The Bank. I want the matte Hunters in black ! I hope this post helps! !